I love kale. It is the mainstay of my vegetable garden, especially in winter. In the kitchen, it’s like having good denim in your wardrobe – it’s practical, comfortable and dependable. It can be dressed up or down…and it goes with everything. The interesting leaves can rival many plants for ornamental value alone. There are such beautiful varieties of kale available that I like to include it in landscapes, when possible, even if my clients think they don’t want to eat it. 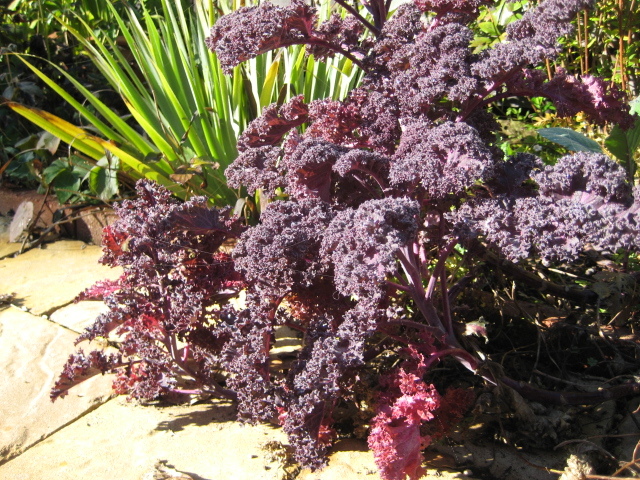 “Red Russian” kale is one of my favorites with grey-green leaves edged in magenta. 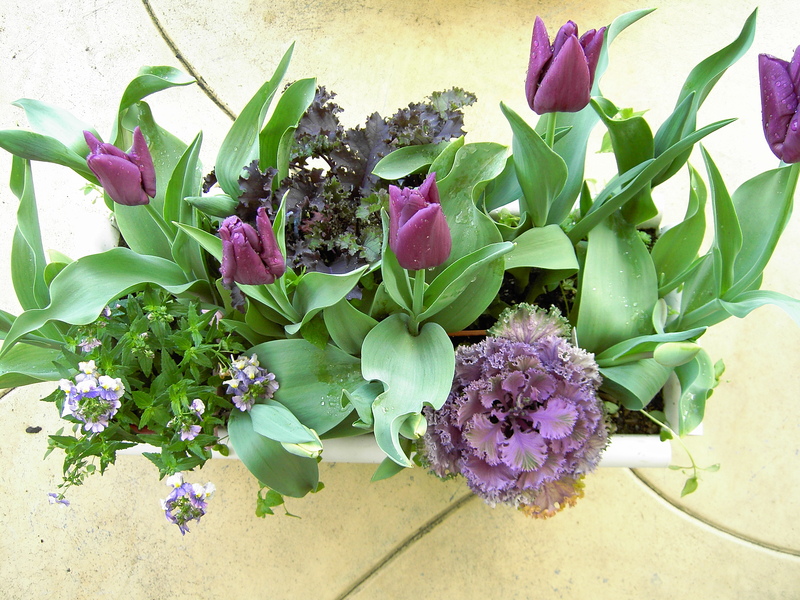 I love to plant it with pink or purple tulips and violas. 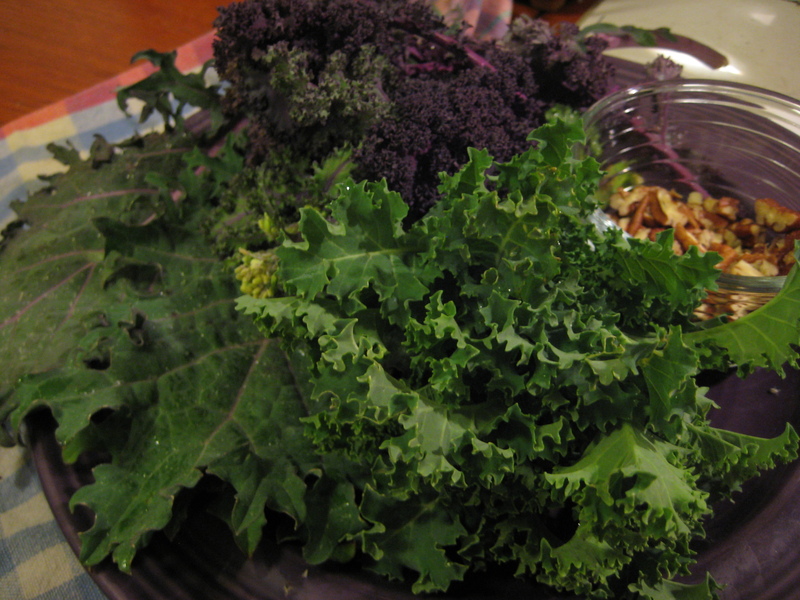 There is a purple curly kale that is a garden stand-out especially when contrasted with bright green or golden foliaged plants. “Lacinato” kale is an Italian heirloom also known as Dinosaur kale for it’s puckered grey-green leaves that look great with blue flowered plants or white leaved ornamentals. I have also been growing a dwarf blue kale for a number of years. Its curly-edged leaves are lovely, and I’ve had great luck keeping the same plants going for three years now by cutting them back once they flower – but not pulling the whole plant out by the roots. My latest favorite is an heirloom variety from Portugal called “Tronchuda Beira”. Its large leaves are bright green with a prominent white rib that looks somewhat like collard greens. The older leaves on this plant tend to get large and beautifully undulated, sometimes with a blush of lavender on the white ribs in cold weather. While kale grows great year round, it becomes sweeter with the onset of cold weather. 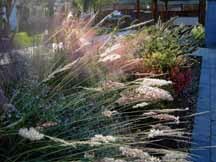 The plants do best when established in the garden before the first frost. Kale plants “hold” well over the winter, but don’t grow much once the weather turns really cold. If you’re putting in new plants, for a cool season garden, it is best to plant by late summer so they will have time to fill out during warmer growing conditions. If you wait until cool fall weather to plant seeds or seedlings, you probably won’t have enough growth in time for a winter harvest. 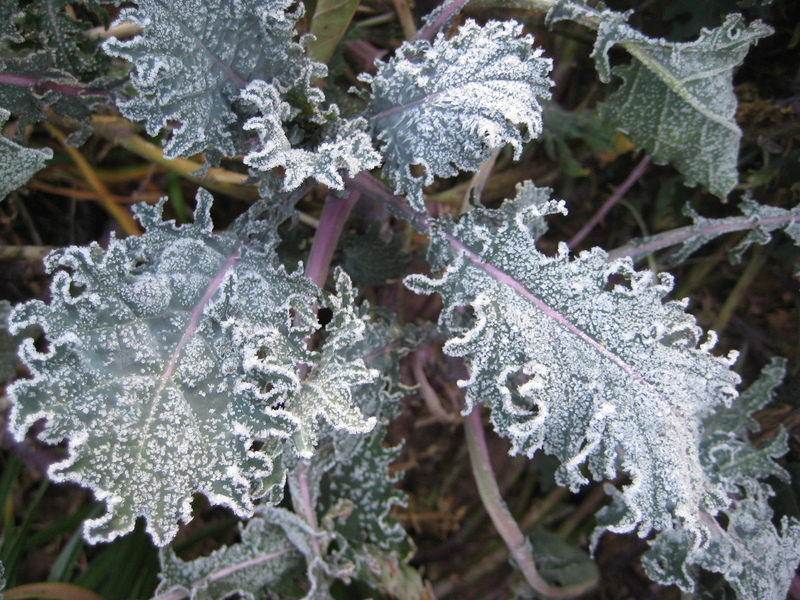 If you harvest kale leaf by leaf, as you need it, a few plants can keep a small household supplied throughout the winter. The kitchen is where the versatility of kale really shines. It can be made into slaws, salads, spreads, and chips. It’s famous for a starring role in the Portuguese “green soup” Caldo Verde. (see my discussion of this classic dish as Renee Shepherd’s guest blogger here.) In my own kitchen, I tend to prepare a lot of one pot meals, especially in winter. I usually just chop the kale up and add a generous amount to whatever I happen to be making at the moment. It’s great in stir-fries, pasta sauce, soups and stews. It’s perfect for adding to almost any dish to get extra fiber, vitamins, and color without washing an additional pan. I hope you will be inspired to use it wantonly, but for those who might like a suggestion for enjoying it on its own, here is a recipe to try. It’s meant to be adjusted according to the sweetness of your particular kale and the preferences of your taste buds. So whether you wear your favorite jeans with a t-shirt and flip-flops, or dressed up with boots and a blazer… think of kale the same way in the garden and the kitchen…it goes with everything. Toast pecans, in pan, over medium heat. Add kale, raisins and water. Steam covered 5 plus minutes. Add olive oil, vinegar, salt and pepper to finish. Ryan (age 6) has started enjoying kale, if you can believe it! We need to grow it and cut down on our trips to Whole Foods. Kim, The great thing about kale is the sturdy plants take well to being “handled” by little hands…creating personal interest for kids, from garden to plate.Congratulations on raising a little veggie lover!